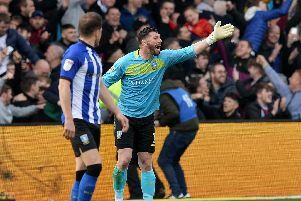 Steve Bruce won’t be standing on the touchline on Saturday but Sheffield Wednesday’s players will still feel his watchful eye assessing their performances against Hull City. That’s the verdict of former Tigers man Peter Swan ahead of the Owls’ visit to the KCOM Stadium. Hull, the in-form side in the Championship with five consecutive league wins over Christmas, will pose a stern test for Wednesday who will also look to extend their own impressive festive run into the new year. Caretaker manager Steve Agnew will be tasked with outfoxing Championship manager of the month nominated Nigel Adkins while the Wednesday defence will need to negate the threat of player of the month nominated Jarrod Bowen if the Owls are to bring three points back to south Yorkshire. But despite not having their new manager in place until February, Swan believes the Wednesday squad will be well aware of the role Bruce is playing behind the scenes. The football pundit wrote in the Hull Daily Mail: “Sheffield Wednesday is a huge club, with a talented squad – one that on paper could possibly be better than the Tigers’ - and while Steve Bruce prepares to start to work in February, his trusted assistants will be in charge. “Agnew and Clemence will be handling day to day business and everything between the hours of 3pm and 5pm on a Saturday and having played with the latter at York City, I know him well. He works hard on the training ground, he has a great reputation and he has the ability to get the best out of this Wednesday side. “However, I don’t doubt for a second that Bruce will be picking the team on Saturday against his old side and the players will be aware of that.